Refubished Holiday flats overlooking the Gynn Gardens, promenade, and sea. Flats 1 and 2 have sea and garden views. All flats have seperate kitchens which include dining table and chairs, cooker, fridge, microwave, kettles and toasters. 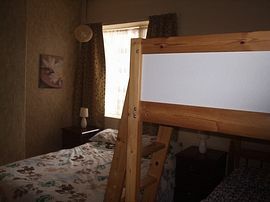 Flat 2 sleeps up to 6 people with bedroom with full size double bed and full size bunk beds and en-suite. 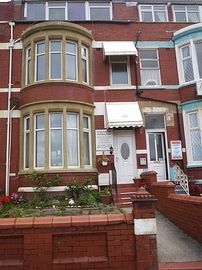 There is a seperate sitting room with garden sea view, full size TV with freeview and DVD player this flat also sleeps 2 on a quality sofa bed and has an en-suite. There is a seperate kitchen diner. 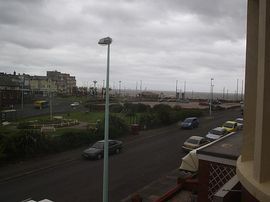 Flat 1 with garden and sea view has a seperate bedroom with full size double bed, and full size single bed. 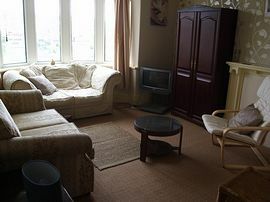 There is a seperate sitting room with full size TV, freeview, and DVD player. It also has a double sofa bed and Ikea bed chair. There is a shower, toilet and sinks in each room. The flat has a seperate kitchen with dining table and chairs, full size cooker, fridge, microwave, kettle and toaster. Shortly available will be studio flats suitable for 1 or 2 people with own separate bathrooms. Smoking area at the front of the flats. Local Services: Trams, buses along the sea from and trains at Blackpool Station. Proceed along the sea front until reaching the roundabout with flying saucers around it and turn right at the next road into Wilshaw Road. Flats 1 and 2 are £125 low season to £250 high season depending on numbers. Please contact for a price.